In the modern business world, it is hard to predict when the next disaster will strike and which organization will fall victim to it. This is due to the fact that disasters are always unique and their repercussions can vary significantly. 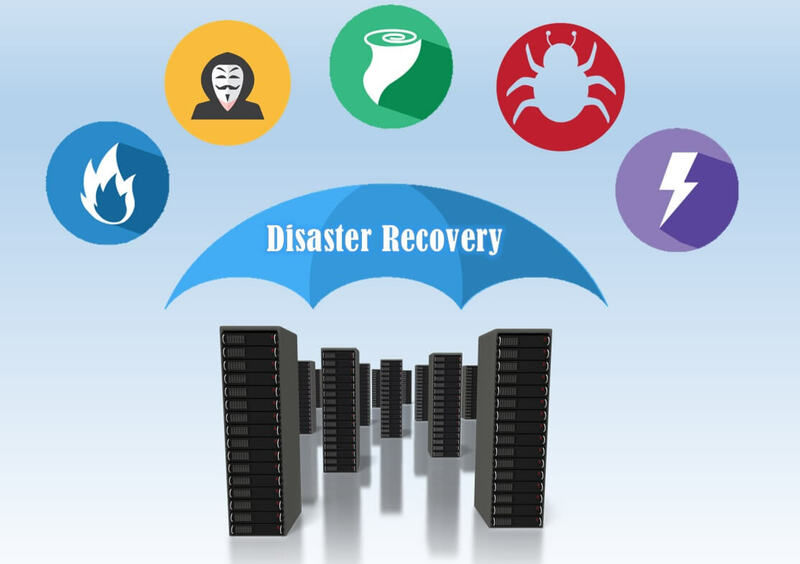 The best strategy which an organization can choose is to design an efficient and reliable disaster recovery (DR) plan, which defines what you should do before, during, and after a disaster. Small- and medium-sized businesses (SMBs) are at a higher risk of not only losing revenue, but also going out of business altogether. By planning out the entire DR process beforehand, you can ensure that any potential loss and damage sustained by your organization on account of a disaster would be significantly mitigated. What is a small business disaster recovery plan? Disaster recovery includes a comprehensive set of tools, policies, and procedures which are used to protect an organization’s infrastructure against disaster. The concept of disaster recovery is closely related to business continuity. The main purpose of disaster recovery is to ensure that business operations are rapidly resumed, no mission-critical data is lost, and the organization provides its services as per usual. Therefore, designing a DR plan can go a long way in achieving business continuity. Why do small businesses need disaster recovery planning? Disasters can be of two types – natural and human-made – and it is generally hard to predict which one is more likely to occur. Even though a DR plan cannot prevent a disaster from occurring, it can help protect your infrastructure in advance. Therefore, it is essential to have a comprehensive DR plan, which takes into account multiple DR scenarios and provides guidelines for mitigating various risks. With a DR plan in place, your staff will be aware of their roles and responsibilities during a DR event. Moreover, the most sensitive and mission-critical resources will be identified and provided with additional protection. Organizations consist of people, and it is a fact that employees are prone to make mistakes which can lead to huge data loss. To prevent or at least mitigate the risks of human error, it is important to include backup and recovery technologies into your DR strategy. They can be used to copy mission-critical data and send it offsite. With a reliable data protection solution in place, the backup and replication jobs can run automatically, thus requiring minimal input on your side and providing near real-time data synchronization. All businesses are at risk of experiencing system failures, which can be caused by power outage, viruses, or failed system updates. This is especially important for small businesses which do not have spare resources to allocate for the DR process. A DR plan can help identify the weaknesses of your infrastructure and asses the possible impact of system failures on your business. On the basis of such information, you can plan what steps to undertake if your system fails and you lose access to your virtual environment. In this modern world, data has become one of the main assets of organizations, without which it would be impossible to continue any business operations. Therefore, it is one of the highest priorities to ensure that sensitive data is protected against any hacker attacks and successfully restored during a DR event. Loss of confidential data can, in the long run, lead to a damaged business reputation and the loss of customers. This is especially detrimental for SMBs as they have a small customer base. An elaborate DR plan provides strategies for data protection and verifies that it can be restored from the DR site. Cost Considered the most expensive option. Generally requires a lot of expenses to provide for hardware resources, staff training, storage space, support and maintenance. More suitable for large enterprises with spare resources. Can be a cost-effective DR strategy for small businesses only if the company is small enough to secure all the data by performing file-level backup. Considered the most cost-effective option. Doesn’t require any additional investment in hardware resources and IT infrastructure because all DR operations are managed by a third party. More suitable for developing SMBs that constantly grow and attract new customers, as they may be required to scale up to store more data. Provides a rigid pricing model, allowing for calculating future expenses in advance. Manageability Provides full control over data protection and DR processes. Staff should be skilled enough to conduct all DR operations, or they might require additional training, which is costly. DR activities and procedures are controlled by a third-party vendor. Reduces the management overhead, which makes it a feasible option for SMBs with a small staff. Privacy and Security Perfect for companies that work with confidential and highly sensitive information because the data is stored in-house and no unauthorized person can get access to it. A high level of security, as no third party can access your data. Data is stored in the cloud storage and, therefore, can be accessed from anywhere. The probability of privacy breach is higher in this case. A third-party vendor ensures data security by using encryption technologies. Performance Data is stored on site, meaning that an internet connection is not required to access data. If your organization expands, additional hardware equipment is required to meet growing demands. Access to data can be lost as a result of a failed internet connection. Provides on-demand scalability of virtualized computing resources. Recoverability All DR activities are managed and performed on site, meaning that if a disaster strikes your production center, it might be difficult or even impossible to restore your data. Recovery time is longer as the entire DR process is executed manually and highly dependent on preparedness and decision-making of your recovery team. DR activities are executed only on demand, which increases the period of downtime. The risk of failure as a result of human error is high. In case of a disaster, the data can be recovered from the backup site, provided you still have an internet connection. Recovery time is minimal as backup and replication jobs can be scheduled to run automatically. Some solutions can ensure almost real-time data synchronization. The backup and recovery process can be completely automated, requiring minimal input on your part. The risk of failure as a result of human error is low. How to choose the right disaster recovery solution? As you can see, data protection software is a more feasible and cost-effective option for SMBs. The real challenge comes when you have to decide which DR solution to choose. The three factors – reliability, usability, and scalability – constitute an efficient data protection solution. The choice of a DR solution is extremely important as the security and sustainability of your IT infrastructure completely depends on it. First of all, take a look at the product’s reputation on the market, find out whether it has attracted a large customer base, and read customer feedback. An excellent reputation shows that the product can be trusted and it delivers services as promised. Moreover, a reliable DR solution is expected to provide 24/7 support and maintenance by professionally trained specialists. As a result, data protection software can significantly reduce management overhead by taking care of all the backup and recovery activities. An efficient DR solution should be compatible with multiple environments (Hyper-V, VMware, and AWS). It is also expected to provide various services which can be easily customized to meet your business needs. With third-party software in place, you can set up the backup and recovery activities to run as you want and, eventually, completely automate the DR process. With efficient software, all this can be done in a few clicks using an intuitive interface. Even though you have a small business at the moment, that can all change in the future and you might need a larger infrastructure with more resources to manage the increased demand. With a data protection solution, you don’t have to buy additional hardware to expand your infrastructure’s capabilities. You can easily adapt to the changing business needs by scaling up your computing resources. Reliable data protection software allows you to add more CPUs or assign a larger amount of memory to existing VMs (virtual scalability) or create an unlimited amount of VMs in your virtual environment (horizontal scalability). The capability to scale up or down is essential for any infrastructure as it allows you to rapidly respond to changes and demands of the constantly developing business world and provide services to customers without disruption. How can Site Recovery functionality help SMBs? SMBs suffer more from the repercussions of failed recovery than large enterprises. An inability to rapidly resume critical operations after a disaster can cause significant downtime, which can lead to not only loss of revenue, but also a damaged reputation, loss of customers, and even business closure. The reality is that many small organizations have not yet accumulated a large budget and can’t afford to spend the earned revenue on deploying DR activities. For a long time, the feature of DRaaS was only available to large enterprises due to its high price and complex functionality. However, many data protection solutions now include disaster recovery functionalities, which can be used to optimize DR activities. NAKIVO Backup & Replication allows you to create site recovery (SR) workflows, which can help orchestrate and automate the entire DR process. When creating a SR workflow, you can include various actions and conditions (start/stop VMs; failover/failback VMs; run/stop/enable/disable jobs, etc.). Moreover, you can perform scheduled non-disruptive testing of SR jobs, emergency or planned failover and failback, and datacenter migration. SR workflows can be tailored in a specific way to ensure that your infrastructure is securely protected and can be rapidly recovered in case of a DR event. SR jobs can be run in production mode, which is applied during an actual DR event, or testing mode, which is performed prior to a DR event to assess the SR job efficiency and verify the expected results. SR job testing can be performed without disrupting your production environment and allows you to see the gaps in your recovery strategy and optimize it accordingly. With NAKIVO Backup & Replication, you can create multiple SR jobs which can serve various purposes and reflect different DR scenarios. It is hard to predict when the next disaster will strike and how serious the damage will be. Nevertheless, you can protect your infrastructure in advance and ensure that the most critical data and applications can be easily recovered when required. For this purpose, you need to find a reliable DR solution that satisfies the needs and demands of businesses of any scope. NAKIVO Backup & Replication has introduced Site Recovery which is a multifunctional toolset, compatible with multiple virtualization platforms that can save your time, reduce management overhead, and cut extra expenses. Thus, if you are a small business looking for a comprehensive solution which can completely transform the way you conduct DR operations, NAKIVO Backup & Replication is the perfect choice for you. To find out more about this feature read our series of blog posts on Site Recovery in NAKIVO Backup & Replication. Or, download a full-featured free trial and test the product in your VMware, Hyper-V, or mixed environment today.